If you have little (or big) monster truck fans at home and are in Tucson, then don’t miss Monster Jam this weekend at the Tucson Convention Center. I have all the details below on how to attend and a discount ticket code. 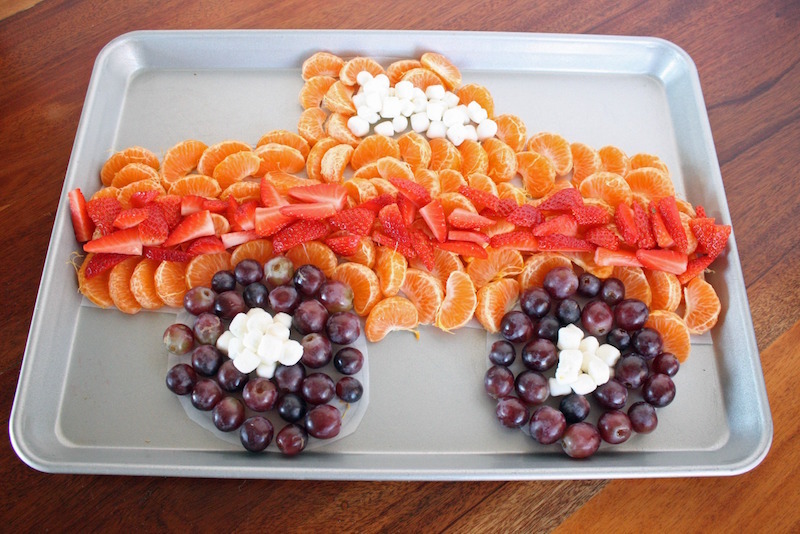 Plus don’t miss my adorable monster truck fruit tray. It’s a super fun way to surprise your kids with tickets, or celebrate with a snack before attending Monster Jam! Save $4 on tickets for the March 3rd at 7 pm and March 5th at 1 pm shoes. Use promo code MOM4. It’s valid at the box office, online or by phone and limited to 8 tickets per transaction. It’s not valid on VIP or front row seating. While I do love celebrating everything with a fun themed cupcake sometimes I need to be a little more responsible. So for our upcoming Monster Jam adventure, I made a fun monster truck fruit tray. It turned out super cute and would work great for a birthday party or just a fun afternoon snack before you head out to see monster trucks in person. The key to getting a decent monster truck design out of fruit is to create a simple template ahead of time. I started by printing a monster truck image I found online. Then I used it as a guide to draw a bigger version on parchment paper. Once I was happy with my shape, I cut around the outline and flipped it over onto my serving tray. This keeps the pencil lead away from the fruit. I think keeping the truck one color makes the most sense, so I opted for a truck body of mandarin orange slices and then just added a fun stripe of strawberries. The tires are made of dark red grapes but I think blackberries or blueberries would be awesome as well. I opted to use mini marshmallows for the side wall of the tires and the truck window. I think bananas, jicama or cups of yogurt dip could also work well. Disclosure: We are receiving tickets to attend the event. As always, all thoughts and opinions are my own.